Offering essential security, as well as a low-maintenance feature for today’s businesses, commercial garage doors from Overhead Garage Door LLC ensure a professional exterior while performing flawlessly hundreds of times a year, each business day. Does your commercial building need a facelift with new service doors? Do you need to update your building to follow local codes or to boost employee productivity? 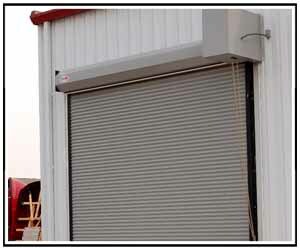 Consider one of the following commercial overhead doors, professionally installed by our garage door experts. With consistent deliveries made during the day, your company needs service doors resistant to wear and tear that will also accommodate the size and frequency of deliveries or arrivals. Doors that open and close without hassle offer security for your building as well as controlled access during business hours. You may need an insulated rolling door system to accommodate a temperature controlled space or an oversized door to allow transport of large deliveries. We’ll suggest a door with the best size and features for your particular space. When your business shuts down for the night, ensure your counter shutter doors offer security for the premises, as well as efficient operation for quick openings in the morning and swift closings at night. Does the community ball field need shutters for the concession stand? Perhaps the service desk at your shop needs shutters. Depending on your business type and security needs, you’ll choose from stainless steel, aluminum, or steel construction. We also work with wood shutters, and our crew will install your new shutters with a frame and sill to ensure durability. Ensure the safety of employees with fire doors that outperform industry standards, and choose from a variety of finish colors with doors that boast quiet operation and toughness. Fire doors allow safe egress from the building and keep your employees, who are the most important part of your operation, safe. Our fire doors meet rigorous safety standards and provide service doors for a variety of properties including commercial, retail, and industrial spaces. While some structures may require service doors with full coverage, your company may benefit from open air security grilles. Commonly utilized in retail stores with interior entrances, you might need a security grill when only part of a commercial building is open. For example, convention centers routinely open only part of the building to accommodate meetings with predetermined space needs. Schools also commonly utilize security grilles for areas like the cafeteria when lunch isn’t in session. Choose from an assortment of styles to fit your preference and needs. Overhead Garage Door LLC offers a commercial door for every need whether you require extensive renovations for a large factory or just need a single service door for your new commercial space. Trust our commercial garage door installation crew with your next renovation, building, or expansion project. We’ll make sure you get the right doors for your needs to enhance security, boost productivity, and improve the appearance of your building.